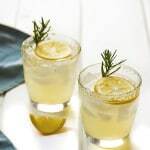 A gorgeous lemon margarita on the rocks made with sweet and tart meyer lemons and sweetened further with a rosemary infused simple syrup. The perfect cocktail to sip on with friends in the spring sun! First make the simple syrup. Place all the ingredients into a medium pot, bring to a simmer and cook until the liquid reduces in half and it gets thick and sweet. Next make the rim garnish. Place all the ingredients into a food processor and whiz it up. If it feels a little moist after, just spread it out on a dish and let it dry out a bit or put it in a dehydrator for a moment. Finally, make the cocktail. Run a lemon wedge around the rim of your glasses and dip them in the rim garnish. Then add the fresh lemon juice, tequila, water and rosemary simple syrup to a martini shaker. shake it good and pour into your glasses. You can also just pour the ingredients into the glasses themselves and stir well.